As a hockey fan and musician, I enjoy seeing the two worlds come together. At a hockey game, it starts with the warm-up music followed by the national anthems. There’s music in between plays (whether live or recorded) and music at the intermission. Away from the rink you can find hundreds of hockey-themed music videos on YouTube. And I’ve been known to put a few hockey compositions together, whether it’s a Christmas Carol, a song from a musical, a classic rock anthem, or an R & B song about our new head coach. 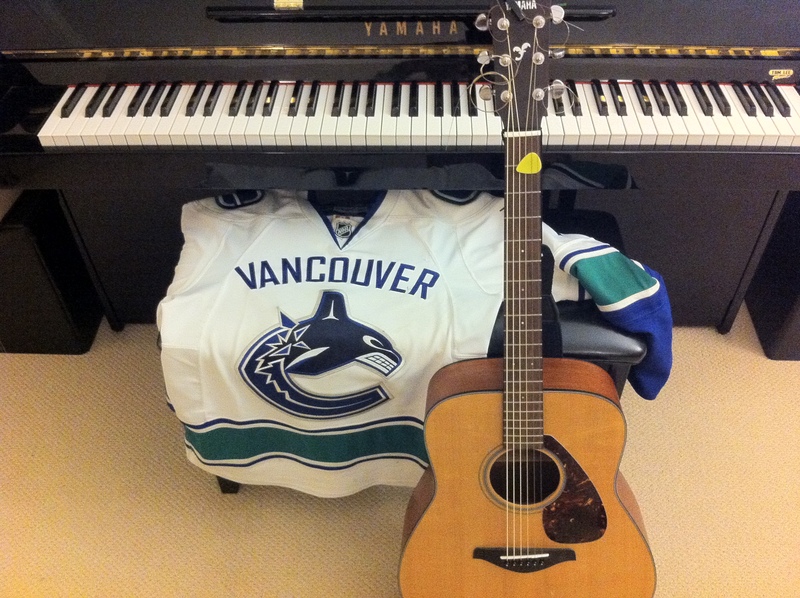 By the way: my new Canucks song will come out next week…it’s going to be a good one. “Life is a Highway” by Tom Cochrane – submitted by @kdmurray. Perhaps a reminder that this season is a long journey filled with twists and curves. “Destination Unknown” by Marietta – submitted by @lyteforce. Of course Chris had to submit something Top Gun related. “New York State of Mind” by Billy Joel – submitted by @DarcyRotaBlog. A witty reference to John Tortorella coming to us from the Big Apple…or perhaps a comment at AV going the other way. “Live and Let Die” by The Wings – submitted by @heatheranner. Something tells me Heather isn’t counting on a strong season. 10. “Money for Nothing” by Dire Straits – submitted by @Canucks_Lions. Not sure if Andrew is talking about the Canucks not having much cap room, or the money that he shells out for tickets. 9. “As I Choke” by Ross Copperman – submitted by @OHYAHH. In his tweet, Justin actually dedicated this song to Roberto Luongo. How thoughtful. 8. “Scream” by Michael Jackson – submitted by @Jas_Ferg. Could be the fans (in a good way). Could be the fans (in a bad way). Could be John Tortorella after a loss. 7. “Don’t Panic” by Coldplay – submitted by @Nrenton. A nice reminder to all fans that the season is a long one and the window of opportunity might not be shut just yet. 6. “Livin’ on a Prayer” by Bon Jovi – submitted by @Kyotea and @sylandrews. Looks like Wylie and Sylvia think the Canucks are in need of some Divine Intervention. 5. “Baby Blue” by Badfinger – submitted by @PrisonBull. A very timely and clever suggestion given that this song was featured in the series finale of Breaking Bad this past weekend. Not exactly sure how the line “Guess I got what I deserved” fits in though. Or maybe the band name is in reference to Alex Burrows allegedly biting Patrice Bergeron’s finger a couple of years ago. 4. “We are the Champions” by Queen – submitted by @Angie_Canucks. Angie is a die-hard Canucks fan and truly believes that this is the year. 3. “Break Your Heart” by Taio Cruz – submitted by @carlz8. Something tells me that Carly had a rough go of it in June 2011 (and in the two subsequent playoff years). 2. “I Love You” by Barney – submitted by @PPGoose. In his tweet, Puck Puck Goose pointed out that the lyric of “won’t you say you love me too” says it all. 1. “Believe” by Yellowcard – submitted by @JThompsondesign. Now that’s a glass-half full approach! #AskCHB: Did the Canucks do enough? Haha…well that’s a tad embarrassing. Thanks for being a good sport…just corrected it. Previous story So You Want to be a CHBer?